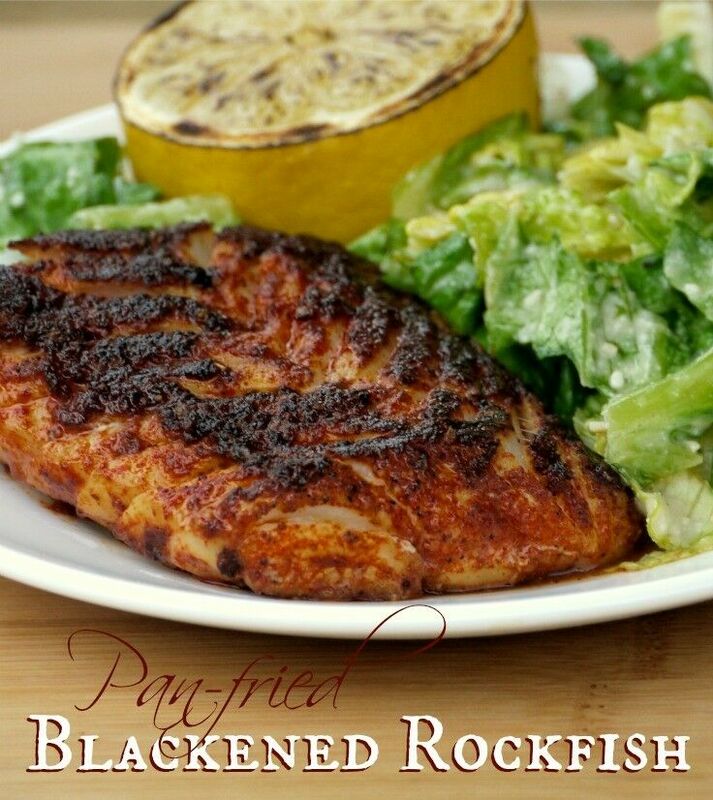 Seasoned with smokey paprika and three kinds of dried peppers, this Spicy Pan-fried Blackened Rockfish has just the right amount of kick! 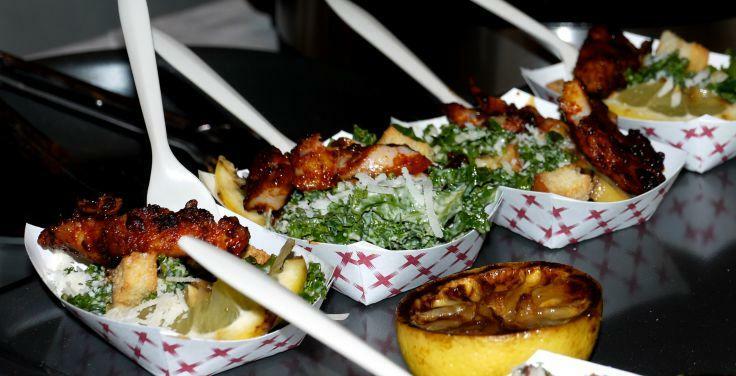 This savory Blackened Rockfish with Kale Caesar Salad from Skillet was my favorite bite at the 2015 IFBC Culinary Expo. The spicy dry rub, seasoned with paprika and three kinds of dried peppers, has just the kind of kick Mr. B and I love. In fact, I loved it so much that I contacted the nice folks at Skillet Street Food asked for permission to share their Dry Rub recipe here, which they very kindly granted. A fresh Caesar salad on the side (traditional or kale) makes the perfect companion dish, quelling the dry rub’s heat without putting out the fire. 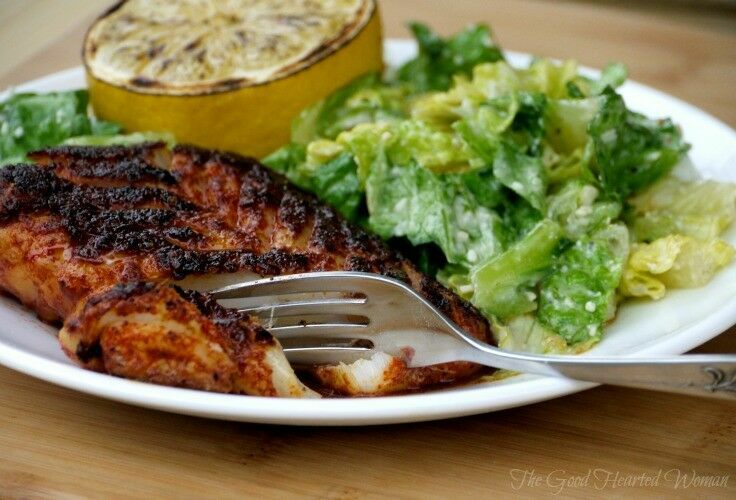 Once you mix up the dry rub, pan-frying the rockfish is a snap! You can literally have this made and on the table in 20 minutes; less if you have the dry rub already mixed up. Heat cast iron or heavy skillet over medium heat until a water droplet sizzles on the surface, then add enough vegetable oil to lightly cover bottom of skillet. Coat both sides of each fish fillet with the dry rub mix and place into the heated skillet. Fry on first side for about 3 minutes, or until the bottom of the fish is nicely browned. Turn over with tongs and brown the other side for 2 to 3 minutes more, until the flesh is firm and opaque. Remove the fillets from the skillet with tongs and drain on paper towels. This pairs well with a Caesar Salad. Since first making this dry rub, I’ve tried the Spicy Skillet Dry Rub on Pacific Cod, red snapper and striped bass; as well as everything from everything from roasted vegetables to barbecued steak, and have never been disappointed. Some of the ingredients for the dry rub were initially a little hard to locate, but once I figured out where to find them, it was a piece of cake. Let me save you some time: you will find the ground pasilla pepper and ground New Mexico chili pepper in the Mexican/Hispanic foods aisle of most grocery stores (in my area, Winco, Freddy’s, and Safeway all stock them) or in your local Hispanic Mercado (i.e., Su Casa Imports, El Mercado, etc). I found the ground chipotle pepper in the bulk section at Winco. 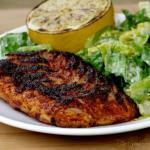 All of the dried ground peppers are very inexpensive and the recipe makes a lot of dry rub, so it will go a long way. That sounds delicious, and so easy!! I love that spice mix, wouldn’t have thought to add mustard. Yum yum! I would use butter instead of a processed oil, would add some flavor too! I usually use coconut oil for fish. 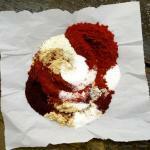 I love the combination of dried ground peppers that go into the rub. It’s such a great balance of smoky, sweet and spicy. This preparation is so simple, Melinda. You can definitely make it! I need to try this! It looks and sounds so delicious. I love cooking with fish and can’t wait to try that spice rub. The pan looks like a good one, too! If I had my way, we would eat fish five nights a week (and veggie the other two). Oh yum, this looks great. We have a freezer full of Salmon, so I’ll probably try the rub out on that first. I haven’t tried this rub on salmon yet. Please let me know how it turns out! My goodness this looks to die for! I want to make it this weekend!!! We are actually in the market for new skillets so I will look into this one. Thanks for the rec and the recipe! It is so good, Catherine – you will love it. Good luck in your skillet shopping, too! I don’t know why but cooking fish always scares me the rub you used sounds delicious so im gonna try it with chicken. Dawne, I just cannot emphasize how easy this fish is to cook. Just rub it and throw it into a hot pan with a little cooking oil. Wait, flip, and then wait a little more. That is absolutely all there is to it. It’s delicious. The spice mix sounds SO GOOD! Can’t wait to try this rub. This looks so delicious! I’m pinning this recipe for next time I buy fish! I’ll have to plan a fish dinner for next week! Thanks for sharing! 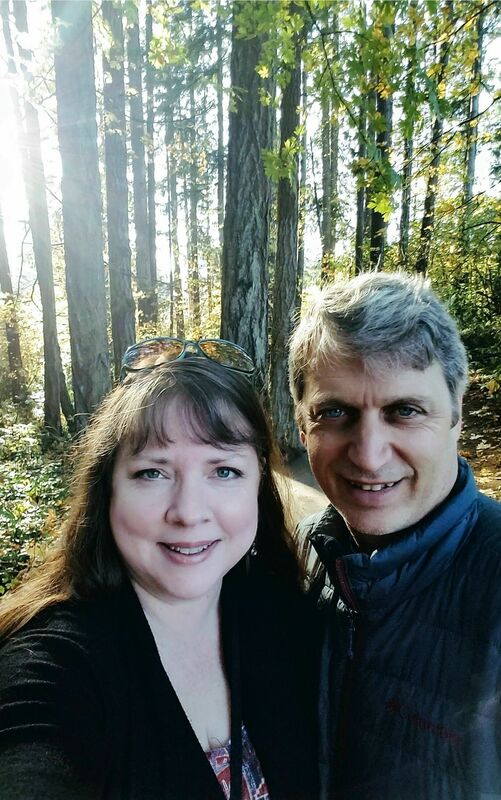 Thanks, Rachel – I hope you love it as much as we do! This looks like a recipe my family will love, thank you! Thank you for stopping by, Brandi! What a fabulous dinner! It’s quick enough for weeknights but elegant enough for weekends. 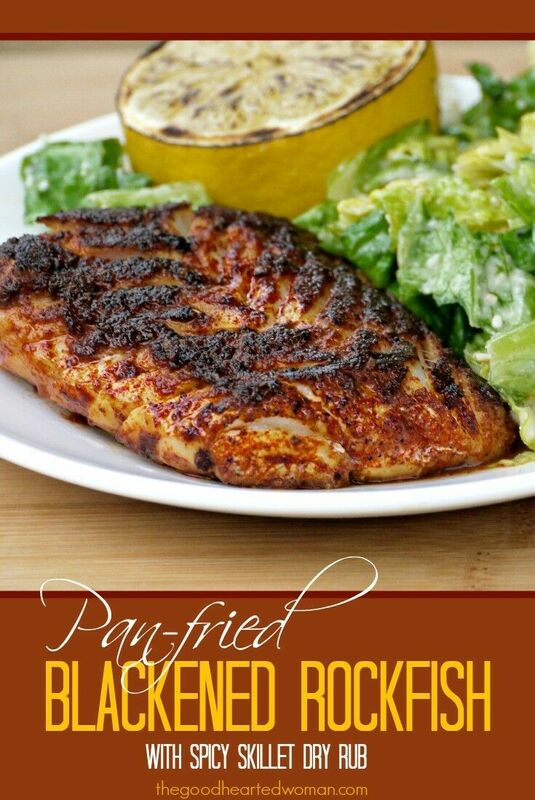 Rockfish is native to the mid-Atlantic, so this recipe is tailor made for me. Can’t wait to try it – with the colorful looking rub. Thanks, Laura! Since first mixing up this rub, I’ve used it on a wide variety of seafood and never been disappointed. We particularly love it on prawns! Great recipe. Thanks for sharing! We tried it on rockfish, but prawns, eh? Sounds interesting! My goodness this was delicious!! I only had cayenne and chili powder so I used that. Thanks for the recipe! So glad it worked for you! Thanks so much for the feedback.